I’m in the process of setting up my own paint shop. Here’s a few pictures during the ongoing construction. This picture is taken through the front doors of the cross flow booth. The open squares will be filled with filters to clean the incoming air. 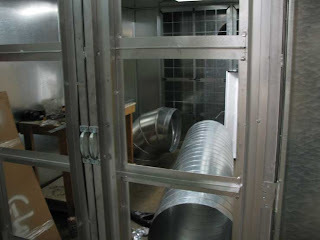 The duct work is sitting inside waiting to be installed and connected to the exhaust stack. The second picture is looking through the front doors. The back wall is visible. This will be covered with filters to catch the exhausting particulates. 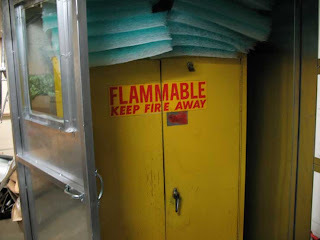 The third picture shows the used flammables cabinet that I purchased. I was excited to find a used one locally because these cabinets are quite expensive. The material on top of it are the filters for the exhaust wall. 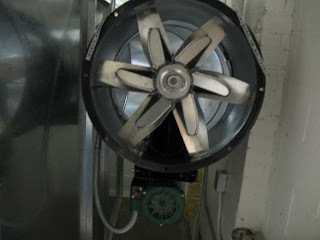 The fourth picture shows the 24″ tubaxial exhaust fan along with the 2 hp motor. 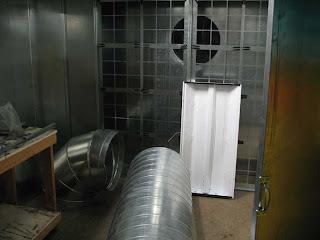 The remaining duct work will be finished soon.